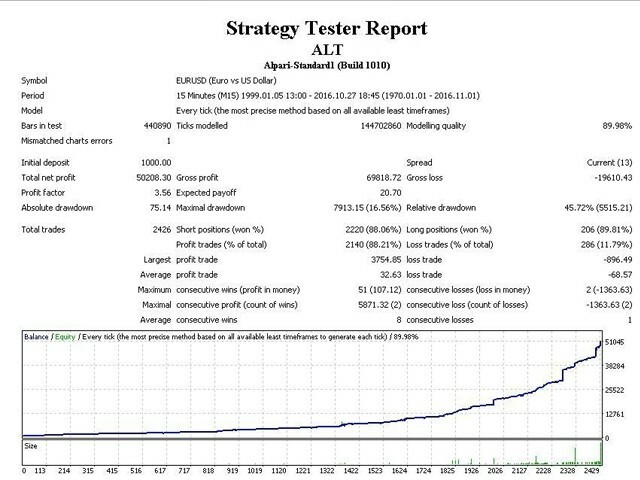 ALT is a fully automated trading Expert Advisor designed for the EURUSD pair. It trades on the M15 timeframe (not tested on other timeframes or pairs). The trading volume used to open a position is defined by the Expert Advisor, it does not depend on the result of the previous trades. The EA uses automated settings, no need to additionally tune it, except for the stop loss setting. Resistant to a temporary loss of connection or a short-term computer shutdown. After starting the computer, the Expert Advisor will continue trading. Always works only with its own orders, you can trade manually in parallel. The required leverage value is 1:500. The recommended minimum initial deposit is 1,000 (USD, EUR, RUB). RiskDeposit - % of current deposit, it being lost the Stop Loss will trigger. "RiskDeposit" is set to 50% by default. The screenshot shows a chart with this value. The ALT EA has been tested on the entire available period. The maximum drawdown in testing was 16.51 %, the absolute drawdown was 0.07%. All other information can be found on the screenshot or test the EA yourself. Оптиматизирован код советника под современные реалии рынка . Функционал не затронут. 1. Added a check of leverage, the required value is 1:500. If a different leverage value is used, a warning will be shown. 2. Now it is possible to configure the "RiskDeposit" parameter. RiskDeposit - % of current deposit, it being lost the Stop Loss will trigger. You have $3000 on your account. RiskDeposit - 40%. If your deposit falls to 1800$ during trading, all the open positions of your EA will be automatically closed. After that the EA will resume operation in a normal mode. P.S. The "RiskDeposit" value should be between 0 and 99. If ou enter a value greater than 99, ALT will set RiskDeposit=99.